I made this Blindweed farming guide to help out players who want to farm the herbs instead of buying them from the Auction House. It's recommended to have around Herbalism 235 , so you won't get herb fragments. Blindweed can only be found at the edge of water, never more than a foot away. Feralas is by far the best place to farm Blindweed. This is the only zone where you can continuously farm without waiting for respawns. Jademir Lake located in the Northwest portion of Feralas, and that's where you should start. 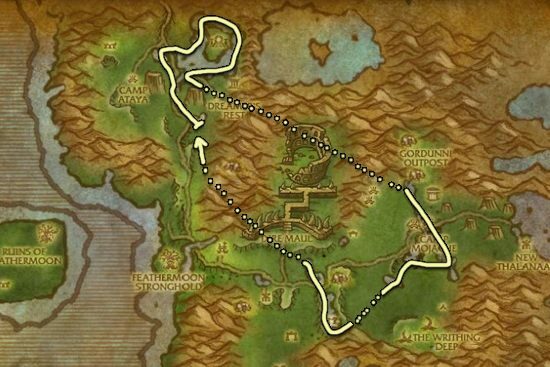 You can get 30-40 Blindweed from just going around the lake and you might not even have to go to the rest of feralas if you don't need more Blindweed. 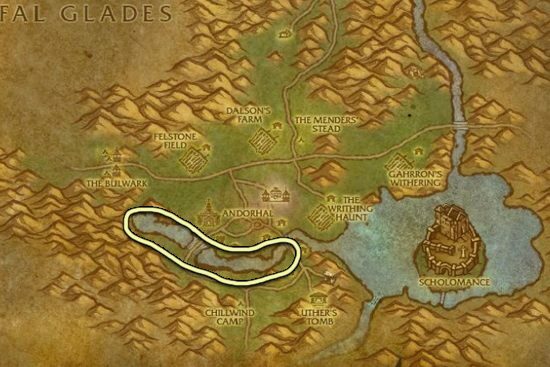 If you need more Blindweed you have to visit the other lakes, rivers, ponds at feralas because the respawn rate is not fast enough around the Jademir Lake. I included this place because sometimes you only need 10-20 Blindweed, and you can get that much from Western Plageulands if that's closer to you than Feralas. You will get all the Blindweed in like 1 minute, but the respawn rate is 5-8 minutes, so you can't farm here continuously.